The Rev. 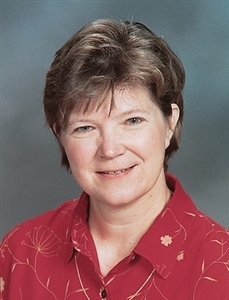 Deborah A. McLeod is the Florida Annual Conference’s candidate for the Office of Bishop. McLeod, senior pastor of Mandarin United Methodist Church in Jacksonville, was the endorsed choice of 58 delegates who gathered at Tampa’s Hyde Park United Methodist Church on Aug. 27. The meeting was the first of three day-long workshops designed to prepare the delegates and alternates for participation in the 2012 General and Southeastern Jurisdictional Conferences. The Episcopal choice was the final order of business for the day, and was the culmination of a six-step process facilitated by the Rev. Jorge Acevedo: Scripture reading; a read-through of some guidelines for discerning an Episcopal nominee; a time of worship and prayer; a time of silent reflection; small-group conversations; and a discussion and time of discernment for the whole group. “It seems like we’re at a holy moment,” Acevedo said as he invited McLeod to the front of the room for prayer. The delegates surrounded McLeod, placed hands on her and prayed. Rev. 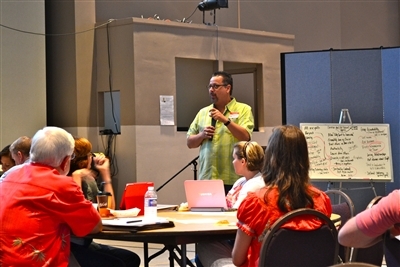 Jorge Acevedo facilitated the first meeting of the 2012 General Conference delegates on August 27. Acevedo, of Grace Church in Cape Coral, also moderated the full day’s proceedings. Key activities included presentations on finances, logistics, the legislative agenda, as well as the Episcopal nominee discernment process. After opening worship, Acevedo offered a devotion detailing his personal testimony of a life transformed by God’s grace. Acevedo concluded by reminding the delegates that making disciples of Jesus for the transformation of the world remains both “our big, hairy audacious goal” and the heart of the mission of Methodism. The Rev. Wesley Olds, leader of the pastoral team at Grace Church’s Cape Coral campus, led delegates in a covenant-building exercise. Participants talked about “great teams” they had been a part of, and then worked to develop a list of 30 to 40 qualities such as trust, confidentiality, “holy conferencing,” accountability and respectful listening for the Conference operations team to condense and circulate. Florida Conference Treasurer and Director of Administrative Services Mickey Wilson presented a brief overview of how Florida’s delegation will be financed. He lauded delegates for their frugality to date, and then pointed out the value of continuing the practice. Per diem rates already have been set well below anticipated costs. McLeod, herself a delegate who also serves as a member of the denomination’s Connectional Table, presented a report on the work of the “Call to Action,” endorsed by the Council of Bishops and the Connectional Table. 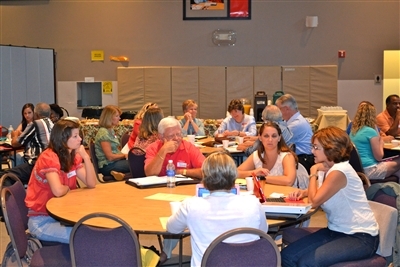 The purpose of the Connectional Table, according to the umc.org website, is to discern and articulate the vision for the church and the stewardship of its mission, ministries, and resources as determined by General Conference and in consultation with the Council of Bishops. 2012 General Conference delegates worked through a discernment process to select an Episcopal nominee. The Connectional Table is proposing a two-phase process for streamlining “General Church functions” via a radical series of realignments designed to be implemented during the 2013-2016 quadrennium. It includes replacing the individual boards of the 11 program agencies with one 15-member board, and a 45-member advisory panel. By 2014, the 11 General Boards would be replaced by four offices: Congregational Vitality, Leadership Excellence, Missional Engagement, and Justice and Reconciliation. A host of questions remain, McLeod noted, such as how organizations like the United Methodist Men and United Methodist Women would fit into the new structure. While the reorganized denominational structure would likely be less expensive to operate, McLeod pointed out that the driving value is effective and purposeful discipleship and the living out of the church’s essential mission. After a working lunch, the Rev. Sue Haupert-Johnson of First United Methodist Church in Ocala led delegates through some of the details of their roles at General Conference, scheduled for April 24 to May 4, 2012, in Tampa—as well as for the Southeastern Jurisdictional Conference taking place at Lake Junaluska from July 18 to 20, 2012. These particulars included dressing comfortably, keeping a loaded toothbrush at hand and ensuring each seat is filled with either a delegate or alternate. Delegates also need to prepare themselves for considerable paperwork, including petitions from interested parties once their legislative committee assignments are published.